Florida Gov. Rick Scott's campaign cited Broward County Supervisor of Elections Brenda Snipes' alleged "history of breaking the law by destroying ballots"
Ballot recounting was expected to begin Monday night in Broward, but sorting was still going on at the elections headquarters. NBC 6's Laura Rodriguez and Jamie Guirola have the latest. All 67 counties are facing a state-ordered deadline of Thursday to complete their recounts and half already have begun. Many other counties were expected to begin the work Monday after a weekend of recount drama in Broward and Palm Beach counties, home to large concentrations of Democratic voters. But on Monday, recounting had yet to begin in Broward as ballots were still being sorted and ballot pages separated, elections officials said. There was no word as of Monday night when the recount would begin. 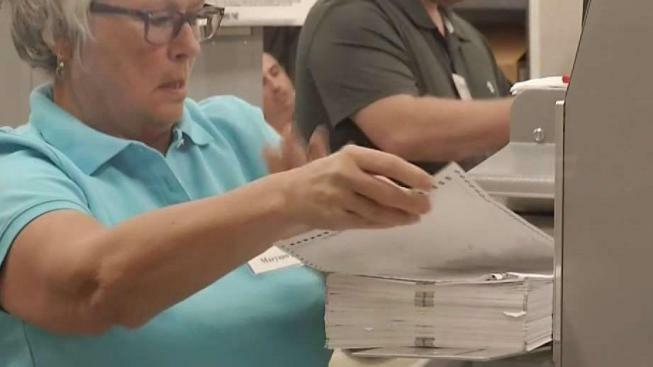 In Broward County, the recount was delayed for hours Sunday because of a problem with one of the tabulation machines. The recount continued to be delayed on Monday. The delays prompted the Republican Party to slam Broward's supervisor of elections, Brenda Snipes, for "incompetence and gross mismanagement." Snipes said the recount was expected to begin Monday night, and said they would still make Thursday's recount deadline. "I think the lawsuits as they are written certainly cast aspersions on my character and usually we build character over a period of time and character is always on display and I've worked here for about 15 years and I have to say this is the first time that this office or I have been under such attacks," Snipes told reporters Monday. "If we make mistakes, we own mistakes. If there's something that the public needs to know then we provide that information." An emergency hearing was being held Monday morning over Scott's suit before Circuit Chief Judge Jack Tuter. Tuter said he wouldn't issue an injunction as he's seen no evidence of wrongdoing in the vote-counting in Broward and urged all sides to "ramp down the rhetoric," adding that there is a need to reassure citizens that the integrity of the Florida recount is being protected. To that point, he urged lawyers for Scott and others representing the Republican and Democratic parties and their candidates as well as the Broward County elections office to agree on some minor additions in security, including the addition of three more law enforcement officers to keep an eye on things. Nelson Lawyer: Did Explosive Packages Delay Mail-In Votes? Also on Monday, Sen. Bill Nelson, the Democratic incumbent, sued the Florida Department of State in an effort to count vote-by-mail ballots that were postmarked before Election Day but not delivered before polls closed. Scott campaign spokesman Chris Hartline called the lawsuit "nothing short of a legal white flag of surrender." The outcry from Democrats over's Scott's suit was immediate. "An honest vote count is no longer possible" in Florida, President Donald Trump declared Monday, without elaborating. He demanded that the election night results — which showed the Republicans leading based upon incomplete ballot counts — be used to determine the winner. Unofficial results showed Republican former U.S. Rep. Ron DeSantis led Democratic Tallahassee Mayor Andrew Gillum by 0.41 percentage points in the governor's contest. In the Senate race, Scott's lead over Nelson was 0.14 percentage points. AP writers Tamara Lush and Brendan Farrington contributed to this report.